Modify a SNES to play imports! Note! This mod will not allow you to play EUROPEAN/PAL games! These games differ not only in cartridge shape, but in display speed (PAL vs NTSC) and they have different ROMs. I have seen cartridge adapters available but given their price and availability, you might be better off to get another system. Modifying your SNES is quick and only requires two things: A strong hand and a pair of side cutter pliers. Nintendo is a wonderful company whose only attempt at territorial lockout (At least for North America and Japan) is a different shaped cartridge. 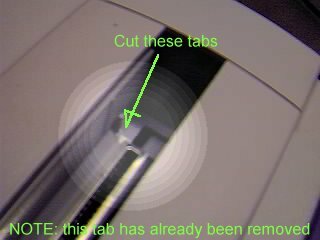 Open your SNES cartridge slot, stick the pliers in, and snip off the two tabs at the back of the slot. Be careful not to apply any pressure to the cartridge slot, I've never had a problem but I would imagine you could break it. Presto! Your system is now ready to accept imported (ie Japanese) games!